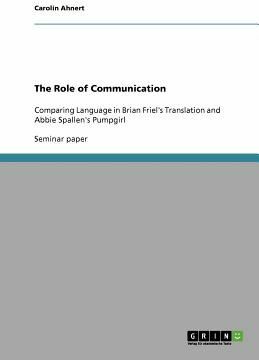 Seminar paper from the year 2010 in the subject English Language and Literature Studies - Literature, grade: 1,0, Technical University of Chemnitz, language: English, abstract: The Role of Communication: Comparing Language in Brian Friel's Translations and Abbie Spallen's Pumpgirl This seminar paper compares two plays from Northern Irish playwrights in terms of the notion of communication among the characters as well as with the audience. Brian Friel is a famous author born in 1929 who became known through his series "Brian Friel Season" on BBC Radio, whereas Abbie Spallen is a contemporary Northern Irish playwright who published Pumpgirl in 2006. This paper gives background information on the Northern Irish Troubles as well as the Process of Anglicisation and therefore the potential loss of the Irish language.